At the head of Lake Mjosa, near Lillehammer, Norway, 1975. 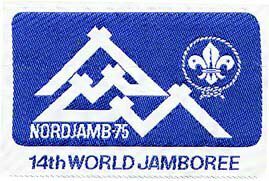 The 14th World Jamboree mustered 17,259 campers from 91 countries. Popularly named "Nordjamb 75". Theme: "Five Fingers, one Hand", typifying the five joint Nordic hosts and the five Scouts Regions in one Brotherhood. Hiking in the mountains in international patrols, activity areas, Nordic trail, superb choir, visit to Maihaugen cultural museum, all the fun of the Saturday Jamboree Country Fair. H.M. the King of Norway opened the Jamboree, also visited by H.M. the King of Sweden and H.R.H. the Crown Prince of Morocco.